Posted in Bright Ideas / Research on November 17, 2017. So your local business has an awesome review profile. You’ve delivered great service and been rewarded in public with unbiased praise for what you do. Great stuff. Reading a positive review is only a single, though certainly significant, step in the purchase journey. What happens after that trust has been gained can still be make-or-break for many businesses. In BrightLocal’s latest Local Consumer Review Survey, published last week, we asked over 1,000 consumers in the US to tell us what their typical next step is after they read a positive review of a business online. The results show an emerging pattern of confidence in reviews, and, crucially, a trend suggesting business websites are becoming less relevant to consumer decisions. 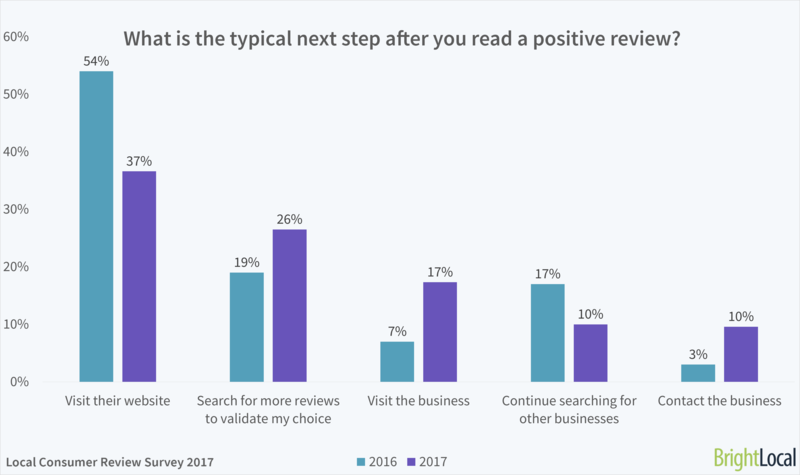 Let’s focus on that first aspect to start with: why are 17% more people now happy to visit or contact the business directly after reading a positive review than in 2016? This change would certainly suggest that the trustworthiness of review profiles has increased in the last year. Couple this with research recently performed by Local SEO Guide which shows that reviews are now the second-biggest ranking factor in the local pack, and you get a strong picture of reviews becoming the de facto factor in choosing a local business to use. The other trends visible in the research certainly back up that assertion. High levels of trust in reviews has led to 7% fewer consumers looking for other businesses after reading a positive review, and 7% more looking for further positive reviews to confirm the validity of the first. This shift from assessing the wider business choices to validating choice with more reviews suggests that businesses now have a far lower chance of getting custom through online reviews if competitors have more favourable reviews. It looks as though consumers used to take the time to shop around, but these days that’s becoming less and less the case. This means that the ‘one-two punch’ of ranking well in the local pack and having a great review profile could be all a local business needs to win customers. 17% fewer people say they’ll go on to visit a website after reading a positive review than in 2016. This brings me on nicely to the other shocking statistic in this study, and one that’s likely to make web developers yelp (pun intended): 17% fewer people say they’ll go on to visit a website after reading a positive review than in 2016. Sure, visiting the website is still the preferred next step, but that is a significant drop from 2016. Reasons for this could vary (and include the veracity of reviews being all a consumer needs to make their mind up), but my hunch is that a big chunk of responsibility for this lies with Google, and specifically Google My Business. 2018: The Year Google Eats the Internet? In the last year, Google has made huge progress in its unofficial goal of pretty much replacing the internet. Not only do SERPs now answer questions for you with Google Answer Boxes, dispensing of the need for searchers to visit the website that went to the trouble of publishing the answers, but in Google My Business, a vast array of new features have been added in 2017 alone. While reviews are all the rage, and yes, many people will choose whether or not to use your business before even visiting your site, the business website is still the most fundamental element of online marketing. 1. A strong website is essential for ranking high in organic search results. Without a website you can’t rank at all, and this impacts local pack results as well. The recently published research from Local SEO Guide found that businesses with high organic rankings were most likely to appear high in Google local pack and maps results. No website = no content = no links = no organic rankings and no local rankings! 8. You have total control over the images used on your website, enabling your website to rank in image searches and ensure the authenticity of photos, which Google My Business, for example, won’t let you do. If you don’t achieve organic rankings, you stand little chance of attaining visibility in local search. The key thing to take away here is that if you don’t work on achieving organic rankings for your site, you stand little chance of attaining visibility in local and map results. And that’s with all the great reviews in the world. So it’s not all doom and gloom for web designers after all! To come full circle, the statistics from the Local Consumer Review Survey certainly suggest that visiting a website is becoming a smaller part of consumers’ local business purchase decisions, though it’s still critical to have one. Whether this trend continues unabated remains to be seen, but given the focus search engines (and now, Facebook) are putting on the local experience, I’d recommend focusing on building organic traffic to your site to boost your rankings and making sure you’re delivering an excellent service to reap the rewards of reviews. After all, did we mention people trust reviews more these days?